It's been a while, and I've been doing some great things for the blog's (and my personal) benefit in the shadows. I thought it'd be high time to cast some light on everything that's been going down. As soon as I know where to start. Michael's waiting. So are we. 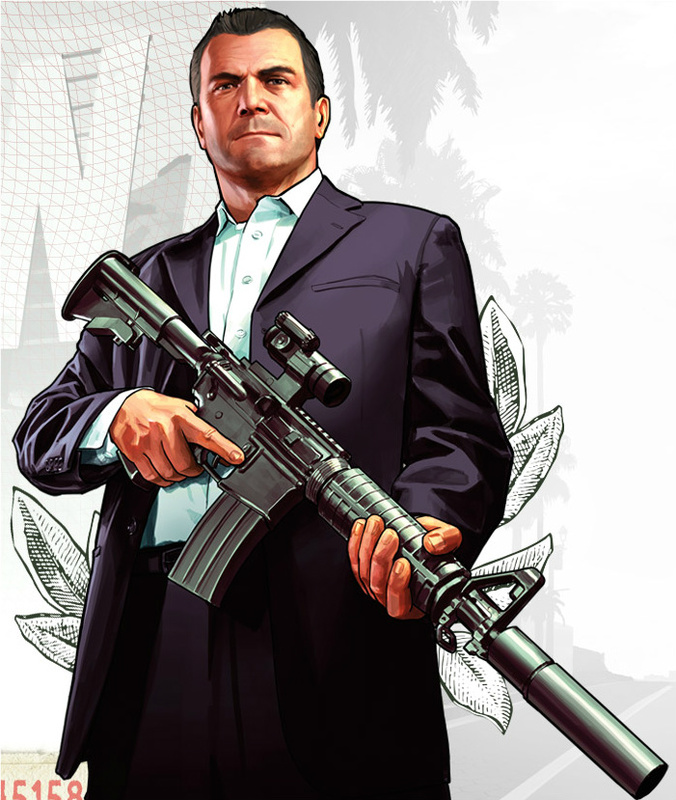 Well, first of all, regardless of where you live or how many fucks you give for the franchise's existence, you must know by now that Grand Theft Auto V is out in 13 days. I must admit that I've been a little distracted from the games I'm actually scheduled to review right now - my urge just got too strong for me to handle, so I finally properly played and finished both of the expansion packs for Grand Theft Auto IV for first aid. I also put the classic Vice City for a spin for old times' sake, and damn, that game still rules after 11 years. However, I personally prefer San Andreas, and since Grand Theft Auto V is set in the very same state, I think I'll put that on next. I haven't forgotten about RPG Time! either - as a matter of fact, the next review is just about done and probably out this weekend. I just hope I can squeeze out a third, one last review before d-day. I've also been working on VGArchive again, although I kind of lost my nerves with it a while back and changed it to a raw text version of my game collection. That raw text version will be online for quite a while, as I'm taking it slow with the site. I'll try to remember to update it every once in a while in the process. I wasn't supposed to buy any games this month, 'cause I decided to invest in the Collector's Edition of Grand Theft Auto V on a complete whim, and it costs €149. It's not even that special, but since I've been waiting for this game so long and I actually got the call and offer from GameStop, not the other way around, I decided to live my no-life to the fullest. Even so, I've bought eight or nine games in the last two months. There's material for each imaginable marathon there. This year's primary Monster Mash is going to be a hoot, a well-balanced and surprising bundle of reviews of games of all ages. I tell you, you'll want to tune in on Halloween week - actually, I'm now very much afraid that time window won't be enough for this rondo of blood. That's not all. I just struck a deal - two, actually. The result: three "new" gaming platforms will be noted in VGMania by the end of the year. No, we're not talking about the Wii U, PS4 or the Xbox One, not at this moment anyway. Two of them are quite distinguished, and they both have very interesting libraries of games. Don't be surprised if you see yet another return of a well-established franchise or two. I'd take a guess that I have access to almost 400 more games than I had just a few days ago - it never ends, does it? Finally, some sections of the blog (ie. the FAQ) will be totally renewed within the next couple of months, marking the transition to VGMania vUmpteenth.0. I'm still working on a new logo, and thinking whether or not I should change the whole template. We'll see. Arrivederci, hasta la vista, smell ya later.